Blade length :　34.6　cm or 13.62 inches. Shape : Wide and thick Wakizashi with Saki-Zori. Hamon : Nie Deki, Choji Midare and Gunome Midare. Special feature: Ujifusa was a sword smith in late Muromachi period. The famous sword smith name is Wakasa Kami Ujifusa. 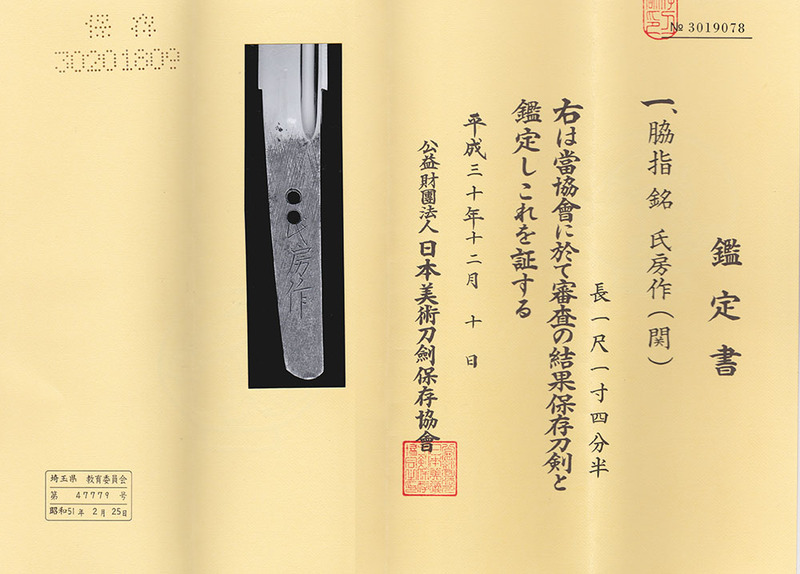 Accrding to the clear Jigane, this blade was made around late Muromachi period. And also the Hamon looks like Shinto’s one. From Aoi Art: This blade is clear and does not have Shirake-Ustsuri. The Hamon is also brilliant Choji Midare. We recommend this Wakizashi for you.